This Orange-Mustard-Garlic, Greek Crispy Pork Roast is delicious as the crackling is golden brown and crunchy, while the meat remains juicy and tender. Roasting pork for Christmas is very popular in Greece. This tradition dates back from antiquity when the farmers would sacrifice a pig to God Saturn and to Demeter the goddess of harvest, to protect their crops and bring fertility to the land. In more recent years, at the beginning of the past century, eating meat in Greece was a luxury for our ancestors and they would eat meat only on special occasions. Raising a pork was cheap and easy. They could sell the meat, eat some and preserve enough to keep for the remaining year. Before refrigeration people in rural areas would raise a pork to slaughter it before Christmas and use every part of the pig. The head and feet were cleaned, scorched and boiled to make “pichti“, a kind of aspic. The intestines were used to make sausages or a dish called “bombari”, the belly and feet were used to make a soup called “patsas”. 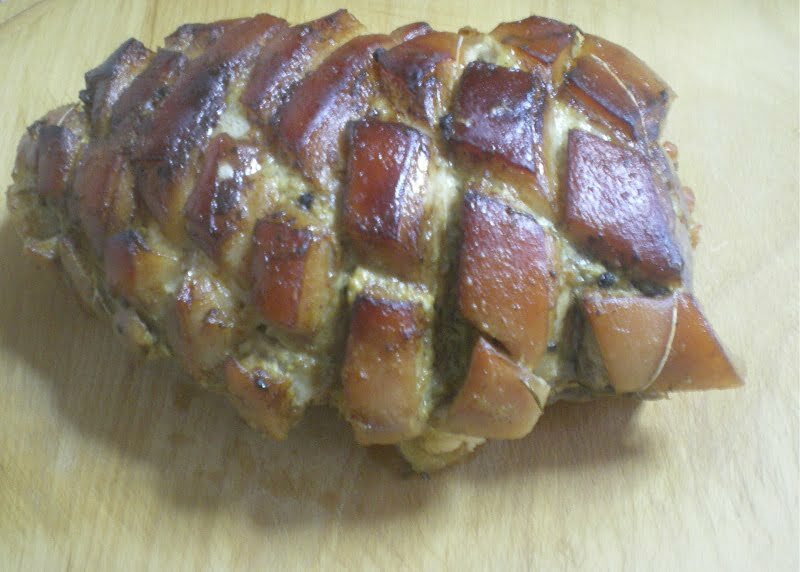 The pork loin was made into “lountza”, other parts of the pig were smoked to make “syglino” and other parts were cooked and preserved in pork fat (lard). The lard was also used for cooking and even for making desserts. Gourounopoula psiti or bouzopoula as it is called in Lakonia and Arcadia, is a whole roasted piglet and is very popular during festive times. It is also very popular in Argolida, which I think is a tradition brought by the Arcadians, as a lot of them migrated to Argolida during or after the Revolution. You will find it sold in many tavernas, at festivals (panigyria) and there are even street vendors selling it in various villages. (There is one every Saturday in Assini). We are still lucky to have butcheries in Greece and there is just one around the corner of our house where we’ve been shopping the past twenty years. I am sure this recipe would be even better with a loin but I wanted a cheaper cut so I described to our butcher what I wanted to do. I told him that I wanted the skin on and to score it and cut an opening for the filling. He chose a nice piece of meat from the leg, which he prepared the way I wanted it. I roasted it with the skin on as when it comes to the crunch, it’s hard to resist a plate of tender roast pork with perfect crispy crackling. Although at first sight you may see a lot of ingredients and stages for this recipe, however, this Pork Roast is easy to prepare and tastes fantastic. This recipe is too good to be eaten only at Christmas, so if you haven’t made up your minds what to cook for Christmas or New Year’s day, this would be a great idea. I used ingredients I had at home and just followed some tricks I learned over the years to make this succulent, tender meat and crispy rind. First of all I brined the meat, just like I do for turkey and filled it with ingredients we all love. I wrapped the baking tin with an aluminum tent, again the same way as I make stuffed turkey, and when I uncovered it two and a half hours later, a fabulous aroma of garlic and rosemary filled the kitchen. If you plan to make it on New Year’s day, as we usually wake up late on that day, the good thing about this recipe is that you can do most of the work the previous day. You can start the brining procedure one day earlier and the next day prepare the marinade and stuff and tie the meat. Wrap it in cling film and refrigerate it overnight. Also, peel, wash and cut the potatoes from the previous day and put them in a bowl of water. The next day just put everything in the oven and forget about it for at least two and a half hours. When you remove the foil the house will be filled with an amazing aroma! Prepare the sauce and the serve! I you have any leftovers (unfortunately we had none), it can be eaten cold the next day, add thin slices in sandwiches or make, pork gyros with pita or a Bulgar pilaf with pieces of meat in it. Ask your butcher to score the skin and underlying fat 1/4 inch deep in a cross-hatch pattern at 1-inch intervals or do it yourself using a sharp knife. Also ask him to cut somewhere in the middle, making a large, flat piece of meat, where stuffing will be added. Wash the meat and put it in a bowl with brining ingredients. Cover with a lid and brine overnight. Next morning drain and pat dry meat. Put all the mustard marinade ingredients in a food processor and mix to prepare the paste. In a non-stick frying pan sauté the bacon and set aside. Cut halloumi into slices. Season the pork with salt, pepper and oregano. Brush the inside part of pork with half the mustard paste. Add slices of bacon, halloumi and prunes. Fold the meat and tightly tie with kitchen string. Brush with the remaining mustard paste and add peppercorns in the gaps between the skin. Position a rack in the lower third of oven and preheat oven to 200o C / 400o F.
Peel and wash the potatoes. Cut them in the middle and then cut each half diagonally, into 3 or four slices, depending on how big potato is. Each wedge should be about an inch thick. Season potatoes with salt, pepper and oregano. Put the Sweet and Sour Dressing ingredients in the same food processor and mix. Arrange potatoes in a large baking tin and put the meat in the middle, skin facing down. Pour the dressing on top of the meat and potatoes. Make an aluminum tent and cover the baking tin. Place baking tin in the oven and roast for 2 1/2 hours. Remove the foil and turn the meat over and add the apples. Lower the temperature to 180o C / 350o F and continue roasting. Turn the potatoes over and remove the apples and about 1 cup of the pan juices. Continue roasting, until the skin is brown and crisp and meat is fork-tender, for about half an hour. Meantime put the apples and pan juices in the food processor and mix to puree. Put the mixture into a small saucepan and washout the food processor with the milk. Add the milk to the apple puree and simmer for about 10 - 15 minutes until the sauce reduces and thickens. Transfer pork to a cutting board or platter and let it stand 30 minutes before cutting. Serve with potatoes and apple sauce. That roast looks delicious and so moist! Your pork roast looks so moist. I’ll bet the dressing and the juice from the pork was delicious with those potatoes. Χρόνια Πολλά!! Χαίρομαι που όλη η οικογένεια απόλαυσε αυτήν τη γευστικότατη συνταγή!!! Delicious as always Ivy!! So many steps! You sure this recipe is doable for mere mortals?!? I love how you add in elements of your other recipe techniques like the brining. Haven’t seen a pork roast that utilizes brining before. I’ll have to try this the next time I’m in the mood for a roast. Oh, yes! It is dooable and in fact quite easy. That’s how I cook! If it works for a turkey, it works for any meat! le porc est la viande qui s’accommode le mieux avec les saveurs sucrés. Très bonne fête de fin d’année et à bientôt.